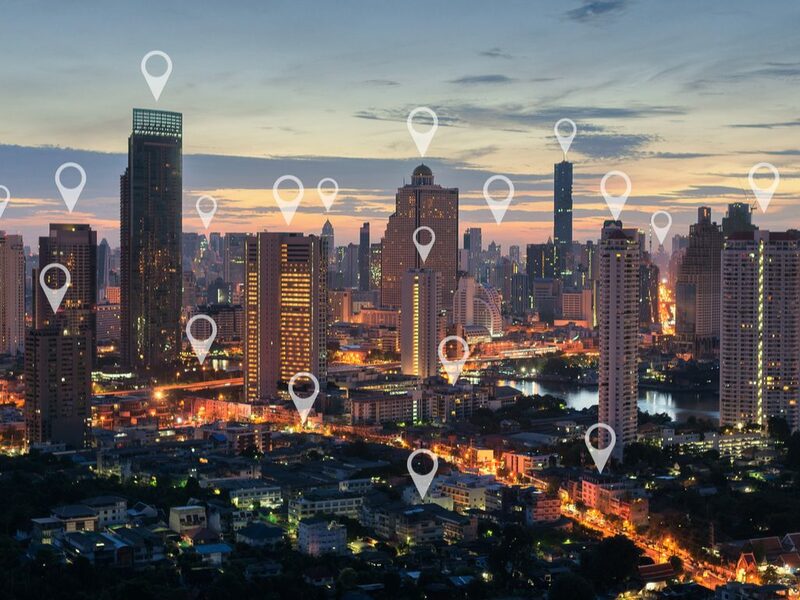 If you own or operate a location-based business, you’ve likely dreamed of the day you can attribute marketing dollars to real-life foot traffic. Google started working on making this dream a reality in 2014, but the feature only rolled out to a limited group of high traffic companies. Over the last few months, Google started making a larger feature roll out to small businesses and enterprises. Advertisers can now track the campaigns, keywords, and devices that lead to store visits in Google’s ad platform. Up until this point, advertisers have been able to attribute ad campaign success in Google Ads through website traffic, website events, online purchases, and phone calls. While these metrics do a great job of measuring the intent of searchers to visit a location, store visits allow businesses to see how this online intent actually translates to foot traffic. The third portion of the campaign was the mobile website. Since the rate of mobile Internet adoption is expected to pass desktop Internet useage in two years, it was almost essential to offer a mobile interface for Boeing Classic. 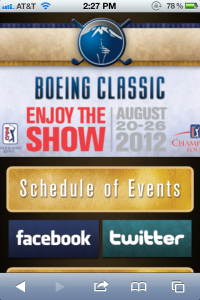 The mobile page featured links to the Boeing Classic Facebook page, directions to the golf course, a schedule of events, and an embedded Twitter widget programmed to grab tweets about the Boeing Classic. The mobile site also featured a tee times page that we updated daily so tournament-goers could see when their favorite players were teeing off. Overall, the campaign was a huge success. We brought more than 1,000 people to the Boeing Classic website, and delivered more than half a million ad impressions to Boeing Classic’s target demographic. Our ads were displayed on thousands of websites, spanning more than 50 ad networks. These results echo what we see with our clients every day. Boeing Classic wanted a far-reaching display campaign, and we delivered. This is just one example of how our clients use our products to attract more people to their site. Go to our website to learn more about starting your own digital marketing program. The second part of the campaign was a Pixel Targeting campaign. 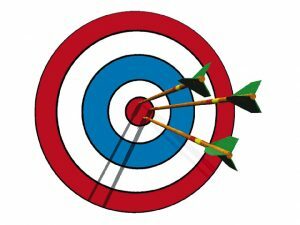 Pixel Targeting is a unique product that we developed to find appropriate customers based on their purchase history, search intent, search history and more. 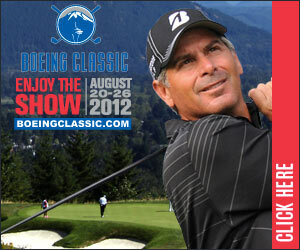 For Boeing Classic, the Pixel Targeting campaign was aimed at Washington State golf enthusiasts. This allowed Boeing Classic to reach out to people who might not have heard about their website, but would be interested in attending the tournament. The Pixel Targeting campaign used the same creative as the Site Retargeting campaign, and the eye-popping design grabbed the attention of golf enthusiasts as they browsed their favorite websites. This part of the campaign was focused on high-volume ad inventory and succeeded in reaching thousands of people in Boeing Classic’s target demographic. The Boeing Classic annual golf tournament draws large crowds throughout the Puget Sound Region and Washington State every August. The $2 million purse and $300,000 first place prize money bring out some of the best golfers on the PGA TOUR Champions Tour. To help promote this famous Washington State event, AdsUpNow sponsored the Boeing Classic with a full digital marketing package and mobile website. The end results were fantastic, as the various campaigns delivered more than 500,000 ad impressions and drove more than 1,000 people to the Boeing Classic Website. Over the next few days, I’ll take you through our campaign and what we did for each part. The first part of the package was a Site Retargeting campaign. 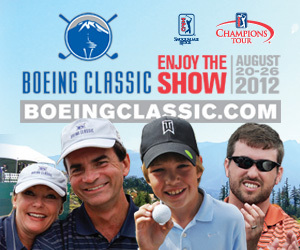 Site Retargeting allowed Boeing Classic to serve ads to everyone who expressed an interest in the Boeing Classic by visiting their website. This repeat exposure helped increase top of mind awareness as the event drew closer, and succeeded in bringing more than 600 people back to the website who otherwise wouldn’t have returned. The Site Retargeting campaign was designed to grab the attention of Boeing Classic’s website visitors. It involved nine sets of creative, each one advertising different events that happened over the weeklong tournament. The campaign was hugely successful, and shows the power of following-up with your current website visitors. Overall campaign stats were extremely impressive: 195,643 impressions, 606 clicks, and a CTR of .40%. Targeting is the new way to reach your customers. In a new study from ValueClick, more than half of all marketers said that they thought Retargeting was one of the most important forms of targeting available. The reason is simple: you are able to advertise and reach out to your website visitors repeatedly, giving you more opportunities to bring them back to your site and heightening brand awareness so they’ll remember you. You already spend money bringing people to your website, so don’t you want to have multiple chances to reach out to them? Retargeting increases the ROI on all your other advertising because it brings back people who you hear about your website through all other advertising. There are other forms of targeting such as behavioral, contextual, pixel and search retargeting. Each one offers a different way to reach your customers, and can be combined to bring you the best mix of traffic to your site. If you currently don’t do any targeting, however, Retargeting is a great way to start. It makes use of your existing advertising and the website traffic you currently have. Retargeting is so simple that if you aren’t retargeting then you aren’t even in the game. It’s time to step up and start Retargeting your website visitors. Don’t think of search engine optimization as the end of your online strategy. SEO should play an important role, but don’t get caught up in the hype of so-called “free traffic.” In fact, you are paying your SEO company to get you that “free traffic” every month. 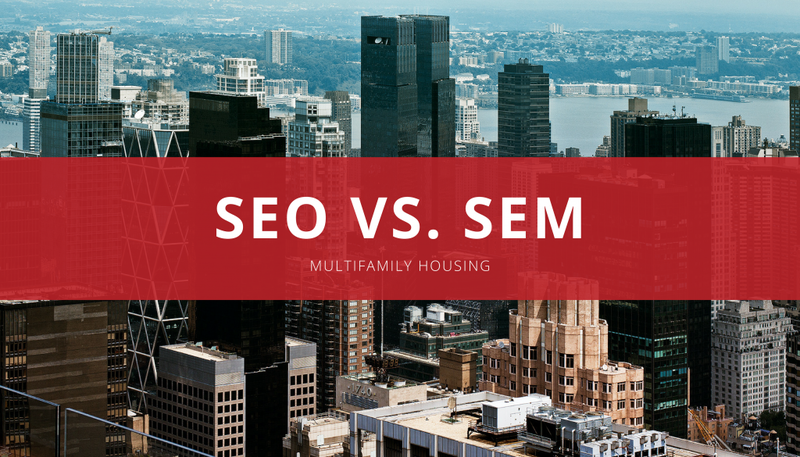 A great alternative to spending money on SEO is SEM. Don’t listen to companies who say their SEO is foolproof. Purchasing ads in Google AdWords is the only surefire way to appear at the top of the search results. The fact of the matter is that SEO is still a guessing game, and that’s the way Google likes it. Google doesn’t make any money off of SEO. Therefore, it doesn’t make sense for them to help websites optimize for higher search listings. A simple search engine marketing campaign can help bring your website more traffic than you would get normally. 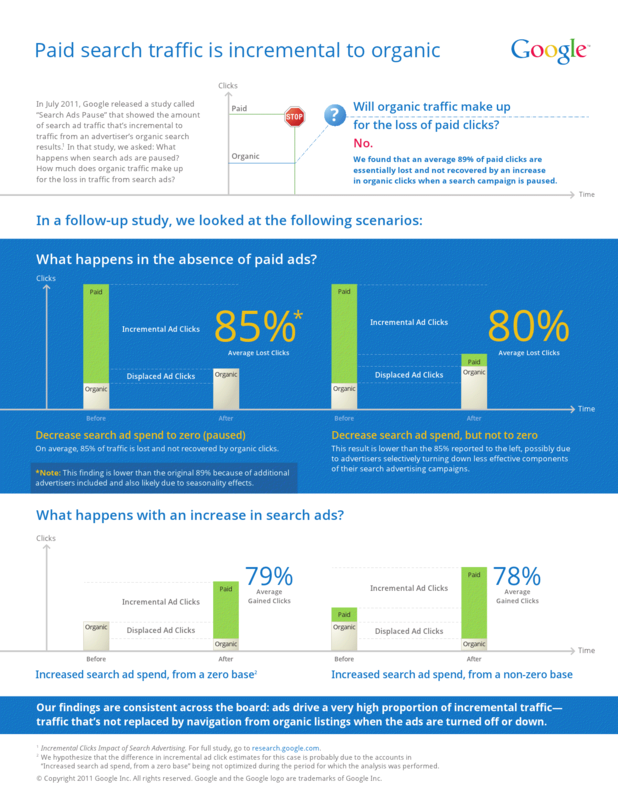 Plus, in a report from Google, 89% of traffic gained from a search campaign was lost when the ads were paused. That means that an SEM campaign lets you reach an entirely different audience than you would get from organic results. If you’ve never done SEM, give it a shot. Go to Google AdWords and create a test campaign and bring some new traffic to your website. Display advertising has been around almost as long as the Internet; however, we’ve seen advanced changes to how display advertising works since those early days of the web. We can now target every display ad to people based on their search history, what websites they’ve visited and what webpage they’re on currently. This gives us powerful tools to provide relative ads to all your customers. Now, a new survey from Econsultancy says that adding search to display campaigns helps improve ROI across the board. In fact, 56% of marketers said they planned to integrate search with their banner campaigns. One type of banner advertising that benefits from search is Site Retargeting. Site Retargeting delivers banner ads to people who have visited your website, helping you increase branding and mindshare throughout the buying cycle. By using search engine marketing to drive people to your site, you can target more people with your message. At AdsUpNow, we provide a la carte packages for all your digital marketing needs. We can help you with search, display, SEO, local, and more. Contact us today to get started with your digital marketing campaign. Search marketing company WordStream says Google has declared war on free clicks and the SEO industry. And I agree with them. Here’s why. 1. Google doesn’t make any money from SEO. That’s right, Google is a multi-billion dollar company whose business is based almost entirely on getting you to click on search ads. It doesn’t benefit Google for you to have “good” SEO – they care about more people clicking. We all like to think that no one clicks on search ads. Wrong. 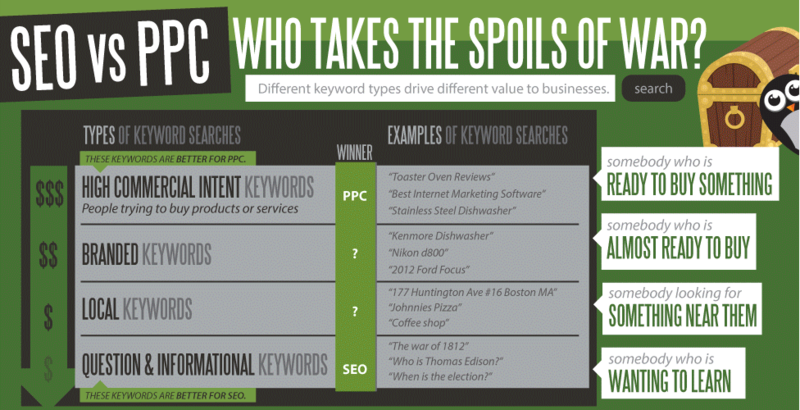 In fact, 64.6% of commercial intent keywords come from SEM ads in Google. Only 35.4% come from organic, unpaid results. That’s almost two-thirds of all clicks that go to paid results. In the modern Google search page, ads and local listings dominate the results. On average, less than 15% of the page is from organic listings. Additionally, the top three spots take 41.1% of the clicks, whereas the top organic listing only gets 8.9% of the clicks. Since Google never discloses exactly what makes “good” SEO, most companies are forced to make educated guesses on exactly what Google is looking for. Those are just three of the many reasons why the SEO industry is dying. Clickstream made an awesome infographic which you can find here. It’s time to start putting your hard-earned advertising dollars into something that converts. Contact us today and see why you should get started with Google AdWords. On Tuesday, Google released a video with some helpful SEO tips for small businesses. Once you get your SEO all figured out, come talk to us at Conversion Logix. We specialize in bringing you more qualified traffic than any other form of advertising. You can watch the entire Google video below. We’ll drive traffic to your website with Search Engine Marketing. Once you get traffic, we can capture leads with a Conversion Driver landing page and remarket to your website visitors with Retargeting. The options are limited for small businesses that want to advertise online. Contact us today for your free consultation and we can help you get more from the Internet.